I taught the ladies in my MOPS group how to make no sew appliques last month but forgot to take my camera to the meeting (I know, I know...won't let it happen again!) Because of sick kiddos, I've missed both meetings this month and haven't had a chance to snap pics of any of the awesome appliques they made. I did happen to snap a few pics of some items I appliqued at home though. Will yall forgive me? This is a blurry close up of the applique I'm wearing in the above shot. Recognize the material? It's a scrap left over from this. 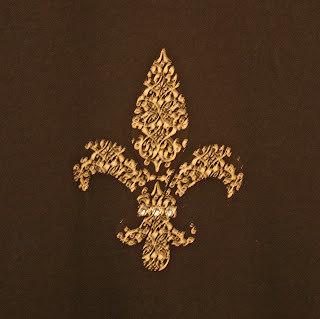 I used e6000 and applied three rhinestones to the fleur de lis after I'd ironed on the applique. You can see them better in the first shot. 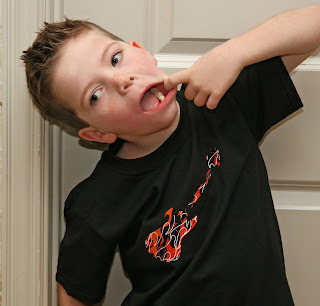 Here is my silly boy modeling his rockin' guitar applique tee. I found the clip art online and resized the image in my word processing software. He loves this shirt! The material is an orange, yellow, red, black and white flame print. My son said it was "so cool!" You can find directions for making appliques all over the web. Here are two links to get you started here and here. It's really late (or early, depending on how you look at it) and I'm not thinking clearly so I'm more than happy to answer questions in the comments area if needed. In our MOPS meeting, we created really cute tote bags. I purchased black canvas bags from an ebay seller in bulk and then the ladies made some adorable appliques. Most of the ladies made adorable monograms or layered cute crosses cut from zebra print fabric or other cute coordinating patterns. I promise I'll post some pics of them once I snap some. If you don't sew down your applique (by hand or by machine) some fraying will occur. I happen to like that look. :) I've also realized you can touch up the appliques with a hot iron if sections seem to lift up. This is great to know if your sewing skills are lacking like mine! I can sew straight lines...but curves are not so pretty! 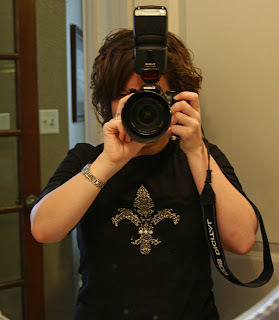 I did make a fleur de lis for a tote bag and practiced sewing on it. It looks terrible! Why did I choose to practice on an applique with so many curves? Is there some secret to sewing small curves? Please tell me there is some super cool secret that I'm not aware of! Otherwise, I guess I'll have to find some time to spend at my machine and figure it out.